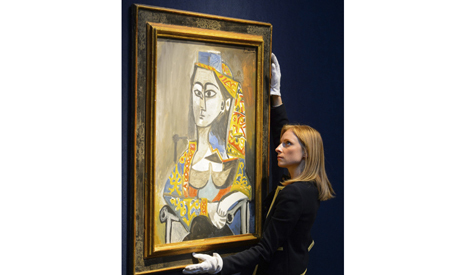 Global art sales hit a new record high of $12.05 billion (8.8 billion euros) in 2013 with China keeping its spot as the top buyer, a leading art market data firm said Wednesday. France-based Artprice said sales of artworks around the globe -- which include paintings, sculptures and photographic prints -- grew 13 percent in 2013. The market rebounded after a nine percent drop in 2012 that was due mainly to a decrease in sales in China. But China remained the top art buyer for the fourth year running in 2013, accounting for $4.078 billion in sales, Artprice said. It was followed closely by the United States, which accounted for $4.016 billion of sales, up 20 percent from 2012. "These two powers alone account for two-thirds of the art market," said Artprice CEO Thierry Ehrmann. Britain was in third position but far behind, accounting for $2.11 billion worth of sales. France was fourth with $549 million in sales, followed by Germany and Switzerland. Ehrmann said growth in the art market continued to rely on the works of a small number of popular artists selling at high prices. "Half of the revenues from 2013 were based on only 100 artists and 25,000 lots," Artprice said. A new world record for the most expensive piece of art auctioned was reached in November when a triptych by British painter Francis Bacon -- "Three Studies of Lucian Freud" -- sold for $142.4 million at Christie's in New York. New York is the "epicentre" of top-level sales, Artprice said, accounting for 39 of the 50 best auctions last year. With $3.55 billion in sales, Christie's beat out rival Sotheby's, with $3.10 billion, for the spot of top auction house. Ehrmann said he expected 2014 to be another record year as the art market cements its place as a "true safe haven" for investors.